Are you dreaming a career as a mobile phone / Tablet PC technician in Dubai? MCTC Dubai will help you to make your dream true quickly! We provide professional, job-oriented training for mobile phone service, repair and maintenance in detail. 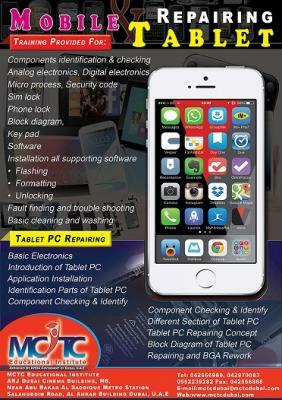 In tablet PC repairing course, we will teach you all the hardware and software aspects of tablet PC, servicing and repairing. Register today and develop the essential skills to become an expert mobile and tablet PC technician from our experts! Take a walk to us, we are located near Abu Baker Al Siddiqui metro station, Deira, Dubai.